Since 2016, the Department of City Planning has undertaken a Gowanus community engagement and planning process with the active involvement of Councilmember Brad Lander and Councilmember Stephen Levin. In March, City Planning issued the formal public notice of a scoping meeting for the Draft Environmental Impact Statement for the Gowanus rezoning together with details of the proposed rezoning. The scoping meeting is intended to be a public forum for comments on the proposed scope of work for the draft Environmental Impact Statement which must be prepared for the zoning proposal. While City Planning had issued previously a Framework for the Neighborhood, and in January, a draft Zoning Framework, the scoping documents provide details of the proposed zoning changes and land use actions. Zoning Map Amendments include the mapping of mixed-use zoning districts and higher density manufacturing and commercial districts. Zoning Text Amendments would establish the Special Gowanus District which would create special use, floor area, bulk and parking regulations. 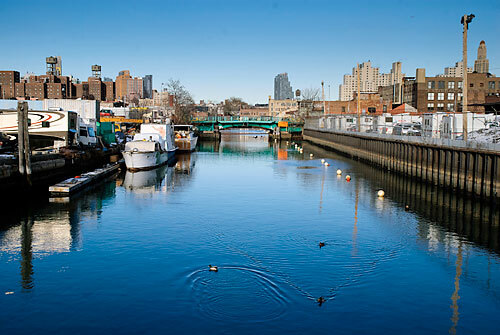 It would also create a Gowanus Waterfront Acess Plan for waterfront blocks, specifying the location of shore public walkways, upland connections and visual corridors. The amendment would also designate this area for Mandatory Inclusionary Housing requiring that a portion of any new residential floor area be devoted to permanent affordable housing. City Map Amendments would also map portions of a block as parkland, demap Bond Street south of 4th Street for parkland, and map new public streets. Fourth Avenue, which borders the rezoning area on the east, would allow the highest densities (8.5 FAR) with 175-foot building heights (17 stories) permitted on wide street frontage. Mixed-use districts in parts of the rezoning area pair M1-4 with R7-2, R7-X, and R6A and R6B. The mixed-use districts with R7-X, for example, would allow residential FARs of 5.6 with building heights of 145 feet. The mixed-use district with R7-2 would establish a maximum FAR of 5.0. with heights of 215 feet along Canal blocks, and 245 feet for lots over 20,000 square feet. Areas with R6A and R7A could reach heights of 85 and 95 feet, respectively. Throughout the area, requirements for accessory parking would be reduced. Within M1-4 districts, accessory parking requirements would be eliminated. The M1-4 would allow 3 and 4 FAR depending on location with permitted heights of 85 and 115 feet. As articulated by City Planning, the rezoning seeks to achieve multiple goals with areas to support mixed-use growth with affordable housing, areas to maintain and grow the Gowanus commercial and industrial businesses by prohibiting residential development, and requirements for ground floors and new public spaces. The draft scoping notice projects that the proposed actions would produce a net increase of 8,200 dwelling units, in addition to commercial and community facility space. As proposed, approximately 2000 permanently affordable homes for lower-income New Yorkers would be created under MIH. A number of issues continue to be raised regarding the rezoning proposal, including potential conflicts between waterfront access and supporting industrial and commercial development, as well as questions regarding why residential development is prohibited in certain areas surrounded by proposed mixed-use districts. On the community side, discussion continues on the proposed densities and heights of projected development, as well as the impact of the rezoning on neighborhood infrastructure and resources. The public “scoping” session on April 25th begins at 4pm and will run into the evening. It will be held at the Middle School (M.S.) 51 at 350 5th Avenue in Brooklyn. The City is hoping to complete the DEIS by the early Fall to start the formal public review (ULURP) process, which includes 60-day review by Community Board 6, 30 days by the Borough President, 60 days by the City Planning Commission, and culminating in a 50-day review at the City Council some time during the first quarter 2020. Capalino+Company is closely tracking the scoping and the details of the rezoning. If you have questions regarding the rezoning and implications for your property, including application of MIH, please contact Richard Barth at 212.616.5845 or richard@capalino.com.